66122 is passing under the Chiltern main line as it approaches Bicester Gavray Junction with 6A49, the 07:32 MoD Stores train from Didcot to Bicester C.O.D., seen from the new footbridge over the chord from Bicester South Junction. This train is booked to run via the chord from Monday 21st September 2015, so this may have been the last run via Claydon Loop as the train was not booked to run the following day, Friday 18th September. 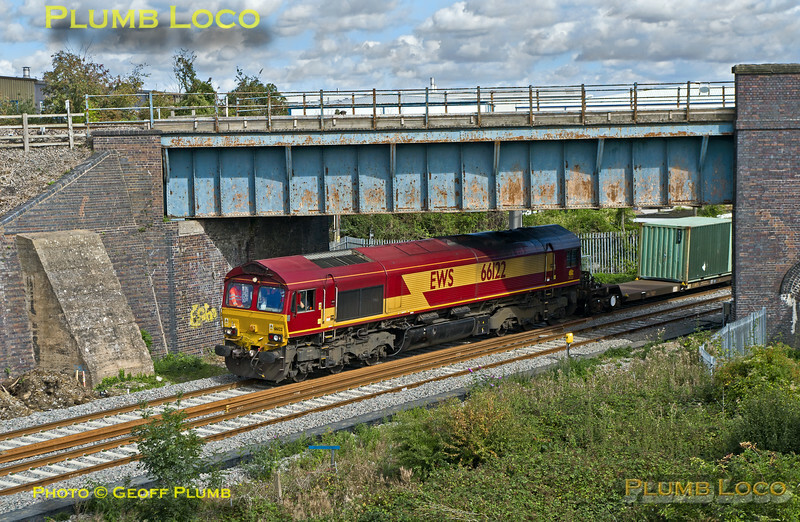 This was a very long train and is running fairly late at 12:23½ on Thursday 17th September 2015. It is apparently running "wrong road", but at present the nearer track is just a backshunt from the junction. Digital Image No. IGMP10722.